Yesterday I hit NYC for a marathon shopping day. I had the Net a Porter friends & family sale, Gilt City warehouse sale, Rent the Runway sample sale and Rachel Zoe sample sale all on my agenda. My first stop was NAP at the Met Pavillion on 18th street. This sale is not open to the public so I was lucky enough to score an invite thanks to one of my shopping buddies. I had heard great things so I was very excited. Unfortunately I didn't get my act together in time and broke my cardinal rule and was not first in line. When I got there at 8:15 for my 8:30 am time slot, there were at least 50 people ahead of me. As this was day 2 I should not have made such a rookie mistake. On line I kept hearing about all the things people found the day before. Ugh. All the bags pretty much went on day one but there were still a few pairs of shoes and lots of clothing left. Problem is, they didn't have mirrors or dressing rooms so I found it hard to shop for pricey designer goods without seeing them on. People stripped down and took pics of each other but frankly for $400-500 a pop I wasn't willing to shell out that kind of cash without a mirror - even if it was for $1,500 Pucci or $5,000 Valentino dresses. I spotted one girl with a pair of Rockstud sandals and I put back a pair of Charlotte Olympia kitty flats in a giant size, but sizing in shoes for the most part was spotty. Lots of 41 or 35 and a handful in between. Case in point, these Jimmy Choo black Yule leather fur lined moto boots that retailed for $1,195. I've lusted after a JC moto boot for a while and almost got a pair at TJ Maxx when they were marked down to $375 but I was decided to be cheap and passed. When I found these for $130 I snapped them up, even if they are size 41.5 (I'm a 40). With a heel or even flat you can't go up that large but with a boot you shove a giant insole inside and call it a day. I did find a 38 that I was gonna pick up as an extra but I gave them to another friend at the sale. These glitter square heeled shoes by Pierre Hardy (retail $695) caught my eye and I almost didn't get them because they were $90 but I like that they're a wearable heel...and actually my size. I initially found these $960 Emilio Pucci shearling-lined suede and leather knee boots in black in a size 41 but they were HUGE. I had remembered that they had a tan in 39 but when I went back they were gone. Luckily someone edited them from their stash and I snapped them up. I prefer this color but they're gonna get pretty dirty (and they already have a few marks) but for $120 I decided to go for it. My daughter already claimed them as her future boots LOL. She asked if they had any in her size but I told her no designer shoes unless they're a penny or her feet stop growing. This $895 Kotur Fitzgerald perspex with dragon and tassel clutch was an impulse buy at $100 but I probably got it because it was one of the few bags left. I spotted some beaten up Valentino totes and broken Sophia Webster watermelon backpacks but that was pretty much it. Probably didn't need it but it is a special piece. They had a few inexpensive beauty products that I passed on but they had these Uslu Airlines lipsticks for $1 at the register so I grabbed a BIR (bright pink). Looks like they retail for $25 so I'm kicking myself for not grabbing more. Gilt City sale was actually next door but the buzz was how expensive everything was so I didn't bother going in and ran to the Rent the Runway sale hoping for last day discounts. I didn't take pics because it was chaos and it's pretty much everything I've shared in past sale reports (here, here and here). 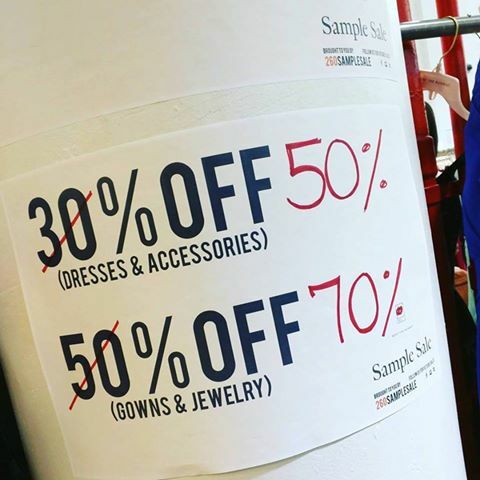 Gowns and jewelry were a whopping 70% off and dresses and accessories (i.e. bags) were 50% off. I stuck around to see if they were marking down further but everything was pretty beaten up so I just headed out. My last stop for the day was the Rachel Zoe sample sale at Clothingline. I usually find cheap Rachel Zoe at the Rack or Burlington but I was curious to see what they had. I'm kicking myself for not heading straight here after NAP because they have actual samples! Tops and bottoms were priced at $25, dresses and coats were $50 and gowns were $100. My advice would be to head right to the back to see what's left on the sample racks. Love this $25 maxi skirt. Too bad samples were all size 0-4 so I was only able to squeeze into her tops and looser boho style pieces. I thought this lace number was pretty and I believe retails for about $1,000. Samples were marked with these solid white tags. As for stock, it was 70% off retail which really wasn't great unless there's a specific piece you're coveting. Lots of dresses, blazers, separates and a few coats. Stock was arranged by size and I saw them pulling from the back if you couldn't find something in your size. To give you an idea of stock pricing, this coat retailed for $965 so it came out to $208.50 at the sale. I saw a few girls trying on this collared LBD, retail $295, sample sale priced $88.50. They had some beautiful leather jackets but they were all over $1,000. This studded leather retailed for $1,395 so it came out to $418.50 at the sale. Frankly that's way to expensive and you can find them cheaper at a discount store. This pearl trimmed gown (they also had a jumpsuit) caught my eye - it reminds me of vintage pieces my very chic grandmother has in her closet. Retail $595, sale priced $178.50. I would watch for further discounts - I would check in Tuesday if you can :) Looks like they will be replenishing and they didn't have any shoes or accessories other than a couple fur scarves at the register. They might have had a few change purses too. Sunday, April 10th through Wednesday, April 13th. Tu-Thu 10am-8pm, Fri-Sat 10am-7pm, Sun 10am-3pm. Tue 10am-8pm, Wed-Sat 11am-8pm, Sun 11am-5pm. Tue 1pm-5pm, Wed 9am-7pm, Thu 9am-6pm. Thu-Fri 10am-7pm, Sat 11am-6pm, Sun 12pm-4pm. I just ordered a yigal azrouel jacket -- cannot wait for it to come. Wish I could be at that sample sale! Hahaha. I thought about going but I needed the day off LOL. Hope I don't regret it! Wow - looks like such a fun day!!! I love your Kotur Fitzgerald clutch - looks very unique! Are you going to Elizabeth and James tomorrow? I'm thinking about going, and would love to meet you in person!!! THOSE BOOTS. I found the non-fur version at CTR in a CA Rack for $225 and thought I got a great deal! Wtf you slay. Also those Pierre Hardy shoes and that DRAGON CLUTCH, I die. As for the Pucci boots, GET OUT OF HERE. OMG that Rachel Zoe leather stud jacket is amazing!!! What a fun day!! I know - fingers crossed for further discounts! wow sounds like a busy day! I'm glad I didn't go to first event- would've made me too sad but you did pick up some fun stuff! I'm obsessed with anything furry or feathered so I love the furry vest! And the LBD is stunning!